Cates Auction & Realty Co., Inc., Kansas City’s oldest real estate auction firm, is conducting an auction of 32 Acres of Kansas City Prime Commercial Development Land at High Traffic Intersection. "Here’s your chance to combine market timing and location at an intersection poised to be one of Lee’s Summit’s next growth corridors,” says Cates Auction President and Chief Auctioneer, Jeff Cates. 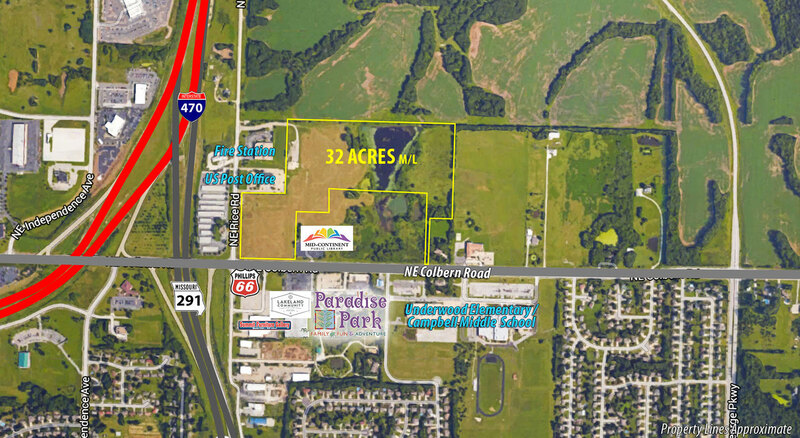 Prime development land in the Lee’s Summit growth corridor is scheduled to sell at auction on Wednesday, March 16th. Located in Lee’s Summit, the sixth-largest city in the Kansas City Metropolitan Area, in the North/I-470 Corridor Planning Area. The immediate area already features a new fire station, retail, post office, entertainment facilities, schools and churches. This property is situated two miles from St. Luke’s East Hospital and only minutes from Lee’s Summit Municipal Airport. Currently zoned CP2 (Planned Community Commercial) and CS (Planned Commercial Services), creating multiple development or investment opportunity for retail, office or industrial uses. Frontage, traffic count and visibility are optimal. Auction Date: Wednesday, March 16, 2016 at 12:00 p.m.
Live online bidding available with advance registration. “Here’s your chance to combine market timing and location at an intersection poised to be one of Lee’s Summit’s next growth corridors. Just off of one of the city’s busiest highway interchanges and with the flexibility to develop retail, office or industrial facilities, you won’t want to miss this opportunity!” says Cates Auction President and Chief Auctioneer, Jeff Cates. Cates Auction & Realty Co., Inc., Kansas City’s oldest real estate auction firm, is conducting the marketing and sale of the property. For more information, contact Ray Bucklew at (816) 695-2163 or for photos and property details visit their website at http://www.CatesAuction.com. Founded in 1942, the privately held, third generation company is located in N. Kansas City, Missouri. Cates Auction & Realty Co., Inc. specializes in the accelerated marketing of all types of real estate. Over the last 74 years, Cates has orchestrated the auction sale of thousands of properties across Kansas and Missouri including iconic residences, estates, luxury lake homes, large acreages and a wide variety of commercial properties. Cates Auction & Real Estate Co., Inc. Excellent Investment & Development Site in High Traffic Location!